A view of Hean Castle from near Monkstone Point. The building has fine views over Saundersfoot Bay , and is on the site of an older fortified building - "Old Castle". 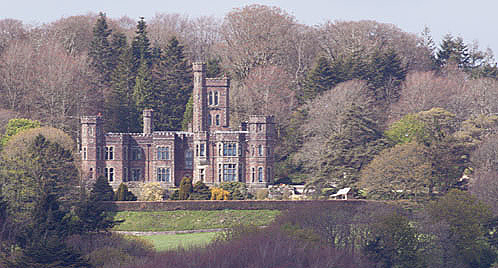 Charles R Vickerman's , son of the Treasurer of the Saundersfoot Railway , purchased the Castle in 1863 and reconstructed Hean Castle in red sandstone with dressings of Forest of Dean stone in the Elizabethan manner. In 1899 Hean Castle was sold to Sir William Thomas Lewis and has continued in the hands of his descendants.